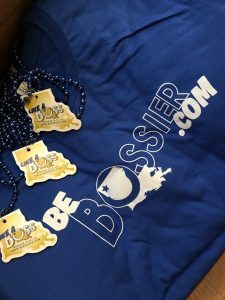 Be Bossier will be handing out free t-shirts and goodies at the event – come see us! The Bossier Holiday Night Market returns this weekend, creating a holiday shopping experience that boasted crowds of 10,000-plus per evening in 2016, its inaugural year. The Night Market, running, this weekend, Dec. 15-16 from 5-9 p.m., has been a great success in the region because of its unique concept – a free, outdoor market boasting 200-plus vendors all in one spot under twinkling holiday lights in the south parking lot of Pierre Bossier Mall in Bossier City. The family-friendly market will feature 225 vendors featuring holiday market goods, unique street food, gifts, wood crafts, jewelry, jelly and jams, salsa, hot coffee, cocoa, live music, children’s activities and more! “The night market is something else entirely,” Graham explained. “You can find anything there! Come out to the market on Friday and Saturday and visit the Be Bossier tent! You can get free T-shirts and beads by taking a photo at the market and tagging #BeBossier and #BossierNightMarket!